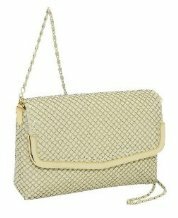 Prezzo channels vintage style with this elegant metal mesh snap bag. Metal mesh has made a comeback in recent years, but with mesh innovators like Whiting & Davis pushing the envelope it's refreshing to see a brand going back to basics. Paired with a simple silhouette and flap closure, the elegant diamond shaped metal plates do all the talking. This purse is available in a range of colors, including basic black, racy red, and glitzy gold, but I think this conservative bone tone is my favorite. It's sophisticated enough to suit any occasion or outfit, but it's just a bit more interesting than white. It's probably too small to suit everyday use, but with some careful packing this purse is perfect for lunches at the country club or a night at the theater. The metal chain strap can also tuck away inside if you'd prefer to carry this purse as a clutch. It might be lacking in size, but Prezzo makes up for that in value. For just $29, this purse is an affordable way to work metal mesh. The Prezzo metal mesh chain shoulder bag, a great alternative to this metal mesh bag.